True story of an escaped slave who regretting leaving his wife and decided to go back to get her. The second song in the Underground Railroad Trilogy (see below for more notes). Without a word, without embrace, I left my love behind. Could grieve me more than to be free without my loving wife. I’ll find the means to bring her here, or be again a slave. 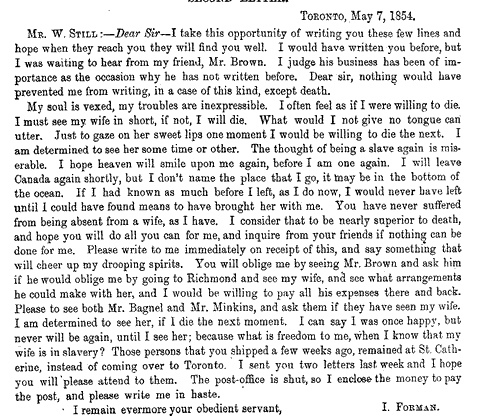 The letter above is excerpted from the 1878 book “The Underground Railroad” by William Still; the book can be viewed online here; Isaac Forman’s story starts on page 64. We don’t know what ultimately happened to Isaac or his wife. I have two other songs based on stories from the Underground Railroad: The Lily of the South and Lear Green’s Hope Chest. The melody I use, Scarborough Settler’s Lament, was written in the 1860’s by a Scottish immigrant who also regretted the move to Toronto.